Large dependable buyers of Treasuries may be thin on the ground in the coming years. The Fed will trim, and eventually stop, its asset purchases. And now China is talking about halting its reserve accumulation. U.S. bond yields could rise faster and further than expected. 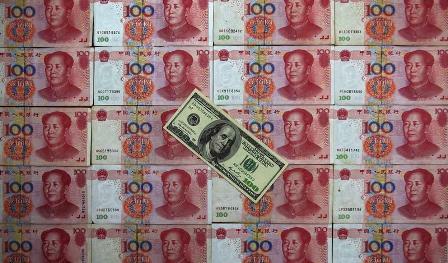 A U.S. $100 banknote is placed on top of 100 yuan banknotes in this picture illustration taken in Beijing May 7, 2013. Reuters: China c.bank: increasing FX reserve "not cost-effective"
China’s central bank governor on Nov. 20 dangled the prospect of speeding up currency reform and giving markets more room to set the yuan’s exchange rate. He said the People’s Bank of China would “basically” stop regular intervention on the currency markets. Yi Gang, vice governor of the People’s Bank of China and the head of the State Administration of Foreign Exchange (SAFE), said on Nov. 21 the cost of holding foreign exchanges reserves would surpass the earnings from them if they continued to grow. “To continue to increase foreign exchange reserves is no longer cost effective,” he told a forum. Chinese foreign exchange reserves rose by $160 billion in the third quarter to a record $3.7 trillion, according to official data. The reserves were at $3.3 trillion at the beginning of the year. U.S. 10-year bond yields rose to 3.01 percent on Sept. 9 from lows of 1.89 percent on May 22, 2013, the day Fed Chairman Ben Bernanke hinted in a speech to Congress that the central bank might scale back its asset purchase programme.